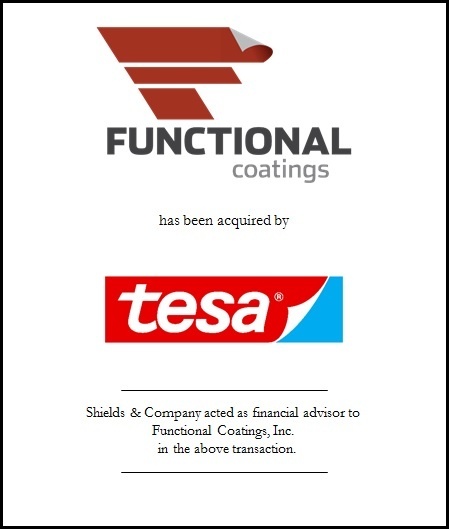 Shields & Company has advised Functional Coatings on its sale to tesa tape, inc., North America. Headquartered in Newburyport, Massachusetts, Functional Coatings is a second-generation vertically integrated manufacturer of innovative, VOC-free, hot-melt adhesives, building products, and tapes. Greg O’Shaughnessy of Nixon Peabody LLP served as Functional’s legal advisor and Todj Gozdeck of Grant Thornton provided transaction accounting services to the sellers. Jeff Corum and Scott Molinaro of Lincoln International and Jason Wagenmaker of Mayer Brown LLP provided financial advisory and legal representation to tesa tape, inc.
Shields & Company acted as financial advisor to Functional Coatings in the above transaction.